In 2018, the world needs documentaries more than ever, yet doc-makers frequently find themselves under-resourced and isolated. Space for the larger documentary community to convene is scarce, but its community members need a place to connect, investigate, learn, brainstorm, problem-solve and recharge. Getting Real is that place. 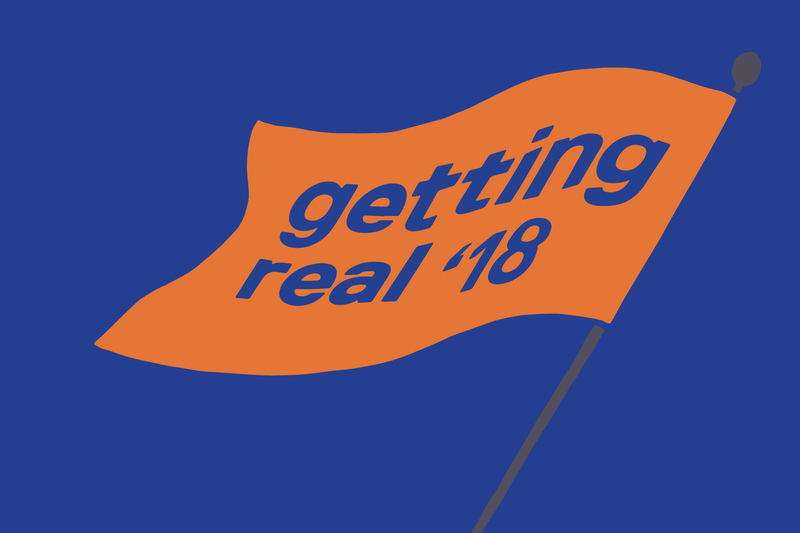 A unique three-day conference on documentary media, and one of the premiere documentary gatherings in the world, Getting Real 2018 features four inspiring keynote speakers (IDFA Artistic Director Orwa Nyrabia; filmmaker Michèle Stephenson; A&E IndieFilms Senior Vice President Molly Thompson; and Chi-hui Yang, program officer for Ford Foundation's JustFilms Initiative), plus 90 sessions of presentations, workshops and structured networking opportunities across ten Hollywood-area venues. In the intervening period since Getting Real 2016, the conference planning team met with members of the documentary community in San Francisco, Los Angeles, New York and Toronto to dialogue about their needs and concerns. The resulting conversations yielded three predominant themes: sustainability, transparency and creativity. These topics ultimately became the focus of the 2018 conference, continuing and building on conference themes from 2014 (Career, Art and Impact) and 2016 (Sustainability, Art and Diversity). I reached out to the conference's programming team—Claire Aguilar, IDA's Director of Programs and Policy; Ranell Shubert, IDA's Educational Programs Manager; and producer Cynthia Kane—to delve into their programmatic journey, the conference content and themes, and their hopes for attendees. Aguilar clarifies that the concept applies to "the filmmaker, but also sustainability for the field of documentary, including organizations, institutions, broadcasters—the whole ecosystem of documentary." Another issue frequently mentioned in the planning conversations: trauma. After all, documentary filmmakers may find themselves in dangerous, violent or life-threatening situations, any of which could leave the filmmaker traumatized. "We heard it from filmmakers," Aguilar says. "There's a need for space to discuss this issue." But filmmakers may resist asking for help or support because the topic may be perceived as stigmatized, she adds. And, as Kane notes, the conversation around a filmmaker's mental wellbeing goes beyond war zones. It includes addressing everyday stressors like finding financing or anxiety around how to make a living. "It's hard to be a filmmaker even if you're not traumatized," she notes. "It's a sustainability issue. Do you continue or do you throw in the towel? Or perhaps you don't have a sense of community because our work is often isolating. People in the industry lose jobs. They have to reinvent themselves. How do you do that?" In response, conference programmers invited Edinburgh-based filmmaker-turned-psychotherapist Rebecca Day to lead an experiential psychotherapy workshop, plus a panel, both addressing trauma (See related article in the Summer 2018 issue). "This is a way of talking about it in a structured way with a psychotherapist," Kane asserts. The discussion will be unique to the documentary community, Aguilar adds. "We've seen a lot of discussions of people, reporters, working in conflict zones and how they are traumatized, but we haven't talked about filmmakers who aren't in a war zone. Or if you're doing a longitudinal documentary and you're embedded with a family—what does that do to you?" Firelight Media, a nonprofit organization dedicated to film production, community engagement and training and mentorship—all in support of social justice issues and illuminating a history that's seldom told. "It's focusing on the gatekeepers, the audience, and the filmmakers themselves, and separating those into three different sessions," Shubert explains, emphasizing their intention to ensure that any panel led for a community is also facilitated by that community. Aguilar adds, "It's an effort to claim the space to talk about documentary from these communities and all these issues, asking questions like, What is an authentic voice? Who is the gatekeeper? Why aren't there many women or people of color in gatekeeping positions? What resources are there for filmmakers? Being in certain communities makes it harder to make documentary films without resources. In terms of the audience, how do people consume these films about knowing their origin or what community they speak to? How do you do outreach to those audiences? Those issues are going to be in these three panels." In addition to the panels, the groups will also have an opportunity to build relationships. "There's going to be a big convening of these three groups," Kane explains. "Not only open panels, but a convening where people come together and discuss all kinds of issues." There will also be a convening and panel for filmmakers with disabilities. Aguilar clarifies that "the panel is going to be talking about experiences of filmmakers with disabilities, but the convening is for a group of 12 filmmakers" who live with a disability. Shubert adds that the panel will also "expand our understanding of what is included in that grouping of disability. Certain diseases and illnesses can be a part of that." Collaborating with members of the documentary community who live with a disability has also alerted conference programmers to issues of access for all conference venues, including restaurants or networking venues. "Accessibility has been a very big priority for us," Aguilar maintains. "We really want to make as much an effort as possible to make Getting Real accessible and accommodating to everyone and their needs." According to Aguilar, in conversations with filmmakers about their needs, the conference programming team heard a lot of people say they "wanted to have transparency and accountability. They wanted accountability for broadcasters. They wanted to know what the processes were for film festivals making decisions. They wanted to talk about how you can be transparent, mostly about decision-making and the gatekeeper role. But it also evolved into how you can be transparent about your own personal budget, for example. Budgets are so fluid, so is there a way to be really transparent about your budget—to your funders, to your peers—and to be accountable for money that is in your budget?" "Filmmakers want to share their experiences, positive and negative," Kane explains, noting there will be "a number of sessions that will be filmmaker-only" and not open to other members of the industry in order to create space for doc-makers to exchange ideas, concerns and solutions. Concerns around transparency apply to data, too. "A lot of the platforms now, there's hesitancy to divulge numbers," Aguilar observes. "Netflix is the big example. They have no demographics. Nielsen does not measure them. Producers have no idea how many people have streamed their film." During their planning conversations, "A lot of filmmakers were saying, 'We really need their transparency in order for us to feel our films are being seen and we’re being productive.'" Inclusion means widening the circle of what community means. For Getting Real, it means access for those working outside traditional film and TV formats. "With the advent of all these new streaming platforms," Shubert says, "documentary has also become more accessible to include many kinds of formats, whether that means podcasting, virtual reality [VR], augmented reality [AR]—all these new ideas of who belongs to the documentary community. And we want to extend that umbrella to those folks as well." Ultimately, the programmers hope Getting Real 2018 serves the entire documentary community, a group that experiences constant growth. "There's been a proliferation of films," Aguilar notes. "Even though it's very hard to make films, there have been so many of them. So what’s happening here?" Being under-resourced or under-funded "doesn't stop people from making films. So the community's size has also really increased." "We’re really trying to reach out to students and younger folks, even enthusiasts," Aguilar maintains. "You don’t have to be a documentary filmmaker to attend the Getting Real conference. So many people are watching documentaries, all the different genres of nonfiction: docudrama, reality TV, working in TV, as well as the feature films. It's just been exciting to be able to handle all of this content and serve all these different audiences with the sessions that we have at the conference." Suz Curtis is a Los Angeles-based writer. Her co-written narrative short Down to Nothing, featuring Twin Peaks' Sheryl Lee, is scheduled to be released in 2019. A graduate of UCLA's MFA Screenwriting program, she's currently working on two feature documentaries.